What? Goats again? Yeah, I know. I just blogged about goats a few months ago (Looking at Goats). But there was a recent study that gave me the opportunity--ok, excuse--to write about goats that climb trees! 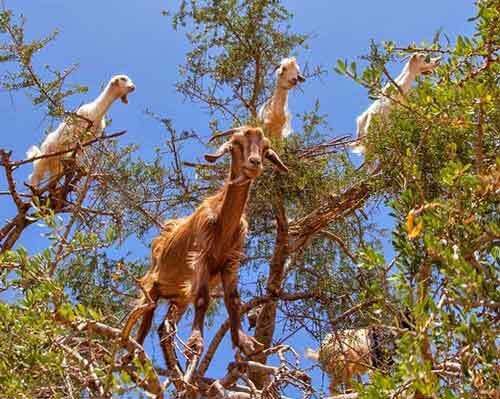 Goats in argan tree, Morocco. Welcome back. I hope you won’t rush off if I hold on the goats and begin with the trees the goats climb. They’re central to this story. Although argan trees (Argania spinosa) are found in Algeria and have been introduced elsewhere, the tree is largely confined to a UNESCO-designated biosphere reserve of some 3000 square miles in the semidesert Sous region of southwestern Morocco. Argan trees are long-lived (150-200 years), evergreen, thorny, reach a height of 30 feet, sometimes more, and have sturdy, knotty trunks, wide-spreading crowns and long, deep roots to survive the arid environment. The leaves are small, clustered and lanceolate; the flowers are small and greenish-yellow. And then there’s the fruit. 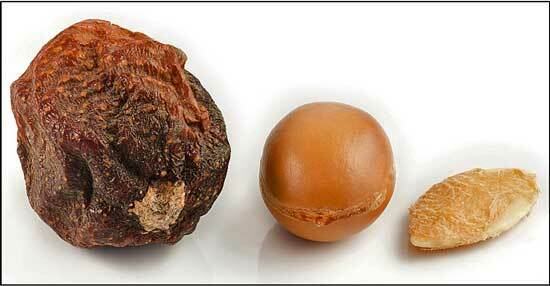 The ovoid fleshy drupes are similar to olives, though larger and rounder, with thick peels covering the pericarp and a hard-shelled nut, which contains up to three small, oil-rich seeds. That oil is used for culinary and cosmetic purposes and has become a high-value product for export. In the U.S., for example, the number of personal-care products with argan oil increased from two in 2007 to over one hundred by 2011. Which brings me back to the goats and the research study. 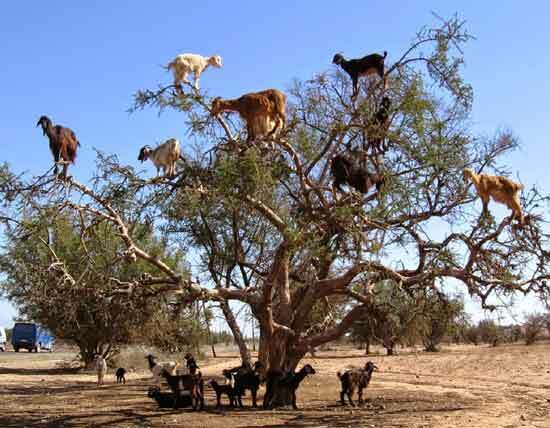 When other available forage is lacking in autumn, these domestic goats may climb the argan trees to dine on the leaves and fruit after the fallen fruit is depleted. Goat herders may even assist kid goats new to climbing trees. One benefit to the tree species of having goats consume the fruit is that the goats will disperse the seeds away from tree and thus give the seeds and seedlings a higher probability of survival. Endozoochory, the dispersal of seeds (or spores) via ingestion and passage through the digestive system, is the popular notion of how the argan seeds are spread. Researchers from the Spanish National Research Council’s Doñana Biological Station were skeptical that endozoochory was the dominant argan seed-dispersal process because goats seldom defecate large seeds. The scientists postulated that the goats, which are ruminants, were regurgitating when chewing their cud and spitting out at least the larger seeds. To demonstrate that goats could be spitting viable seeds from their cud, the researchers fed fruits of different size and structure, including five drupes or pomes and one legume, to Spanish goats. They were able to recover appreciable numbers of regurgitated seeds, though not all since the goats were not under controlled conditions. As expected, they found that almost any seed could be ejected during chewing, spat from the cud, digested or defecated; however, the larger seeds, comparable to those of argan, were more frequently spat out during rumination. The researchers also confirmed that over 70% of the regurgitated seeds were viable. Establishing that goats spit viable seeds from cud has broad ecological importance if it is common among ruminants. Studies of ruminants as seed dispersers based exclusively on dung analyses may have underestimated a large fraction of dispersed seeds, especially seeds from plant species with fruit and seed traits, such as size, that differ from those of plant species dispersed through defecation. And you probably thought I chose the topic just because of the goats in trees. Thanks for stopping by.